Broccoli is a delicate vegetable and should be handled with care. If cooked too long, the florets become mushy. With other broccoli recipes, I remove the florets from the water before the stems so that they retain crispness. I use only florets for the broccoli salad. Make sure you get pancetta! This extremely aromatic Italian bacon should contain plenty of fat. Approximately 50% fat content is ideal. The rendered grease can be subsequently used for frying. Here we will use it to prepare the croutons. Separate broccoli florets from the stem. Bring a sufficient amount of salted water to a boil. Blanch for approximately five minutes so that broccoli remains crisp. Strain hot water from pot and chill with ice water. Finely chop green onions. Separate radicchio from stalk and cut into strips. Dice pancetta and fry in own grease until crispy. Drain from rendered grease and allow to cool. Cut the pumpkin seed bread into cubes and roast in grease (removesomeif it is too much), stir immediately to ensure grease is distributed evenly. 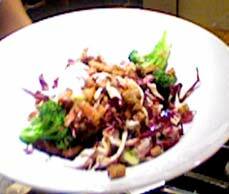 Toss broccoli, radicchio, green onions, and capers. Arrange on plates. Top with cooled bacon and croutons. Dress with salt, olive and walnut oil, and balsamic vinegar.